Suborbital reusable launch vehicles (RLVs) will provide the next generation's foray into space exploration. These "space planes" can provide lower-cost access for space tourism, military missions, and commercial applications. The Commercial Space Launch Amendments Act of 2004 was intended to respond to the increasing demand for lower-cost access to space through launch sites that are not associated with federal facilities or operated by the National Aeronautics and Space Administration (NASA) or the Department of Defense. RS&H has been integral to NASA's missions since the 1960s. The firm's history with NASA's launch pads, the mobile launchers, and other key facilities at Kennedy Space Center have made RS&H an industry leader in aerospace and defense. RS&H also has a strong environmental team that includes in-house noise modeling experts, GIS professionals, and airport environmental process specialists. RS&H's broad range of GIS, aviation, aerospace, and environmental expertise gave the firm a comprehensive understanding of the challenges associated with quantifying and visualizing potential impacts of the developing commercial space travel industry. Esri products were the key to integrating nonspatial data with a project-specific location. The finished product "tells a great story," says Brian Gulliver, RS&H's spaceport development leader. To understand the potential noise impacts, a site-specific noise model was needed. For this application, there were several challenges in creating the noise model: available noise data was not spatially referenced, and typical engineering software could not provide the desired 3D result. Since no RLVs are currently being launched at Cecil Airport, RS&H had to develop a method to spatially link nongeoreferenced rocket engine noise data to Cecil Airport's specific runway location. The noise data provided for the analysis included time, distance, altitude, Mach speed, and measured noise in A-weighted decibels dB(A). The A-weighted network is used most often in noise analysis because it most closely approximates the way humans hear. To identify potential impacts to noise-sensitive sites along the proposed RLV flight path, a study area 4 miles wide, 140 miles long, and 65 miles high was delineated. First, the RS&H team extracted the raw data from a Microsoft Excel spreadsheet and formatted it to be compatible with Esri's ArcGIS and ArcScene software. The team related the movement of the RLV to the Cartesian coordinate plane. The known x,y coordinates of the runway's start became the origin. The distance (east or west) away from the centerline of the runway was assigned to "x." The distance traveled southward down the runway was assigned to "y." The recorded noise levels in dB(A) were assigned to "z." To mirror a proposed launch event, the team created a geodatabase feature dataset to render noise contours in a 3D model using ArcScene. To depict the noise impacts during takeoff, the z-value, which is typically associated with elevation relative to the earth's surface, was substituted as dB(A) values in the Terrain Model environment. The model was converted to a TIN (digital terrain model) and imported into ArcScene for 3D visualization. 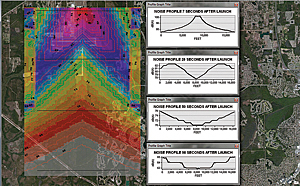 The result was a multidimensional graphic that allowed RS&H spaceport planners to visualize the potential noise impacts. 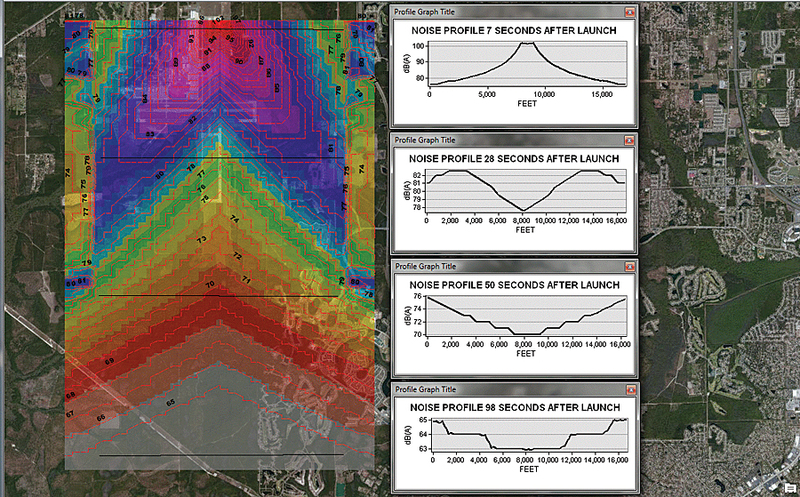 The scene provides a realistic and dramatic view that could be used to quantify potential noise impacts as a launch progresses. Jim Mykytka, one of RS&H's noise experts, says, "Besides facilitating impact assessment, these 3D maps allow the general public to visualize the anticipated noise levels and duration, as well as how the project might affect their community." By making something that is invisible visible with Esri software, the RS&H team set a new standard for the analysis of potential spaceport noise impacts. Lloyd Facklam and Cynthia Grizzle are with RS&H, a firm that provides architecture, engineering, and consulting services. Facklam has more than 33 years of experience as a senior technician/designer with RS&H's transportation program. Grizzle is an environmental scientist with RS&H's transportation program. She has 10 years of experience assessing environmental conditions and a master's degree in environmental management.